Greek hospitality and beautiful, well-kept beaches – this is how the island of Thassos in the Thracian Sea welcomes its visitors. Situated in front of the main island are the three smaller islands of Kynira, Thasopoulo and Panaghia. The vegetation on Thassos has suffered from the effects of extensive forest fires in 1984, 1985 and 1989. The Calabrian spruce has grown back in the south-western part of the island, along with maquis, Mediterranean scrubland. Making your way down towards the valley further inland, you will come across the typical olive groves that define the island’s scenery. Ornithologists find Thassos a veritable mecca, as out of 442 bird species 200 live on this island. 74 species of birds breed on Thassos and in recent years new species have been discovered here. Plovers, black kites, golden eagles or Whooper Swans – the variety of fauna and flora in Greece is simply unbelievable. In the Neolithic era, 20 000 BC, Thassos was part of the mainland. From that era dates the first evidence of settlements in the region of today’s Limenaria. Excavations revealed hearths and tools as well as burial places. In ancient times and antiquity Thassos gained significance due to its valuable goldmines and marble quarries. Don’t miss the opportunity to discover the archaeological treasures of this amazing island. In ancient times wine growing and the Greek vines of Thassos were very much valued. Even today you can enjoy Georgina wines and those made from the rare Limnos grape. The second branch of industry on the island of Thassos is pottery, handmade by locals and available for purchase as souvenirs for tourists at the local market square. Each village on the island of Thassos has comfortable hotels, guesthouses, apartments and suites, all of them perfectly integrated in the Thasos scenery. On this Greek island you will feel closer to paradise. The village of Aliki is located in the south-east of the island of Thassos in the northern Aegean. Aliki lies directly on the coast and consists of two bays and a promontory that reaches far into the sea. Even in ancient times there have been marble quarries and remnants of the former marble quarry can still be spotted in the water. Due to its shape, the southern bay is still dubbed the “bathtub of Aliki”. The promontory is known as the “holy rock of Thassos”; in the 5th and 6th centuries an altar in honour of the gods was erected here, and later a Christian basilica was built in the vicinity. The ruins of these ancient buildings and of many others can still be visited in Aliki. Nowadays Aliki is a small resort where holiday-makers have a great time, enjoying the beautiful sandy beaches on both bays and the intensely blue sea so characteristic of the Northern Aegean. “Chrissi Ammoudia” means “Golden Sand”, and is the name of a beautiful sandy beach in the bay of Panagia on the east coast of the island of Thassos. The light-coloured fine-grained sand and the turquoise colour of the sea form an attractive contrast with the lush green of the vegetation. Mount Ipsarion rises majestically in the background, at 1206 metres the highest elevation on Thassos. Chrissi Amoudia gently slopes into the shallow water of the sea, making the beach an ideal place for families with children. The beach is well-managed, there are deckchairs and sunshades for hire, and directly behind the beach a rich variety of bars, taverns and souvenir shops. Chrissi Amoudia is very busy during the peak season, but with a length of 2.5 kilometres, it offers a lot of space. 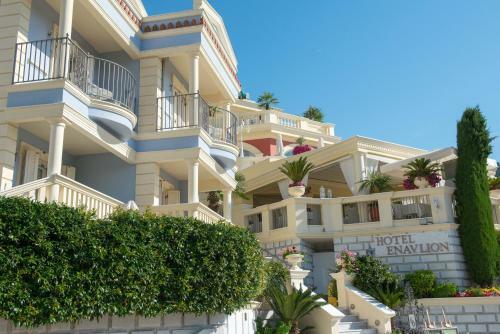 Along the beach there are a lot of hotels and other accommodation options, ranging from small guesthouses to the larger hotel complexes in Skala Panagias and Skala Potamias. There is no lack of restaurants and taverns either, with fresh fish and traditional Greek food on the menu. Chrissi Amoudia is one of the best beaches in the Northern Aegean and paradise on earth for those who love a holiday on the beach. Limenaria is situated on the south-west coast of the island of Thassos. With a population of just under 2500, Limenaria is the second largest resort on the island. Next to the sheltered harbour there is a long promenade along the seafront with a variety of shops where tourists can browse at leisure. In the past, Limenaria was a mining town until the mines were closed down in 1960. The town has been given a new image and a tourist infrastructure to prepare Limenaria for ever-growing numbers of holiday-makers. New hotels have been built in the western part of the town, and cultural events and productions throughout the year, organized by the cultural association “To Kastor”, entertain Limenaria’s visitors and locals of all ages. Limenas of Thassos means “port of Thassos”, and although the capital’s name appears on signposts as “Thassos”, it is colloquially referred to as “Limenas”. Since antiquity, the island of Thassos has been famous for its gold mines, its marble quarries and its wine, all of which were an excellent way to accumulate riches. It also attracted attention from whoever was most powerful in the region throughout the centuries, and has a varied history. Repeated pirate raids eventually caused the inhabitants to leave their port and hide away in the mountains, until the Venetians established a base in the deserted town during the fourth Crusade in the 12th century. In modern times, Thassos was eventually returned to Greece in 1912, after a few years of Turkish and Egyptian rule, and followed by Bulgarian occupation during WW II. For those interested in history, Limenas is a fascinating place. There are a lot of sandy beaches around the island, many of them being very popular. There are several restaurants and taverns including fast food outlets. There are beautiful pine forests on the island, but many of them have been ravaged by forest fires in recent years. Some people prefer Thassos outside the tourist season, and September days are still hot, but bear in mind that the sun sets relatively early and the nights are getting chilly. Pefkari is a small resort in the south of the island of Thassos, between Limanaria and Potos. The charming little tourist village extends along a beautiful sand and pebble beach in an idyllic setting. There are a lot of pine trees and indeed the place name Pefkari derives from the Greek word for pine – “pefkos”. Pefkari consists mainly of beach bars, cafes, taverns and hotels. There is hardly any typical Greek culture to be found, but Pefkari offers tourists a relaxing holiday in idyllic scenery with a beautiful beach, crystal clear water and a variety of water sport options. It is a quiet family resort, without the noisy evening entertainment that a lot of the other, much more crowded, resorts on Thassos offer. The small village of Potos in the south-west of the eastern Macedonian island of Thassos is one of the most popular holiday resorts of the island. Tourism has not deprived the former fishing village of its original charm; Potos is a lively resort with a good variety of hotels, guesthouses, taverns and restaurants. It boasts several beautiful beaches where holiday-makers can relax and enjoy the sun and the sea. The main beach has a mixture of sand and pebbles and is two kilometres long. West of Potos towards Limanaria there is a sandy beach and a little pebble bay. Regardless which beach you choose, the intensely blue Northern Aegean Sea that glitters in the sun is so crystal clear that even deep water is completely transparent. This makes Potos a paradise for snorkelers. The gently sloping beaches are also ideal for families with children. On the stonier pebble beaches it is a good idea to wear bathing shoes when you go into the water. Only about five kilometres south of Potos lies the tiny resort of Psilli Ammos with a marvellous long sandy beach and a variety of water sport options, e.g. water skiing, pedal boating, paragliding, canoeing and surfing. Skala Potamia is situated on the east Macedonian Island of Thassos in the northern Aegean. The little village lies directly by the sea and the southern end of the famous beach of Chrissi Amoudia, called the “golden beach” because of the colour of its sand, and reputedly the most beautiful beach on Thassos. There are deckchairs and sunshades for hire, and the beach is well-managed. Sloping gently into the shallow water, it is perfect for families with children who can safely play in the water. The golden beach, the crystal clear turquoise water, the lush green forests and majestic Mount Ipsarion in the background make the scenery around Skala Potamia one of the most beautiful landscapes on the island of Thassos. There is a multitude of hotels and guesthouses to choose from, and an equally varied choice of restaurants, taverns and bars. The village of Skala Rachoni is situated in the north-western coastal region of Thassos. It has a beautiful harbour and very fertile soil; there is a multitude of spruce forests and olive groves that give the landscape its characteristic appearance. The locals live on fishing and olive-growing. A holiday in Skala Rachoni is for those who like peace and quiet far away from noisy mass tourism. It is the perfect place for a family holiday due to the shallow water and the gently sloping beach. There are a good number of hotels, restaurants and taverns in Skala Rachoni, and those who like fresh fish can look forward to a feast every day.